This fabulous Plum Worcestershire sauce from the queen of preserves Sally Wise, comes via my Tasmanian sister-in-law, who makes it regularly using the small red cherry plums that grow rampantly in the backyards of Hobart. I made this sauce two years ago using cherry plums from a friend’s tree in Bathurst but this year, all the plums got eaten by flying foxes, so I had to make do with ordinary shop bought plums. Sally Wise suggests Damson plums (which I’ve been unable to source) but you can substitute other fruits – apricots, apples, pears, nectarines, peaches or any other kind of plum. This recipe makes a massive amount so you only need to make it every two years and you will still have heaps of sauce to give away. 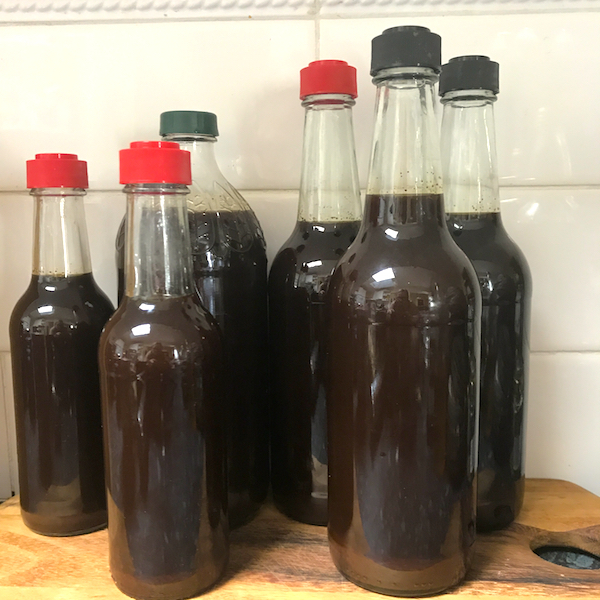 I halved the recipe this time because I didn’t have enough bottles for a full batch and it still made nearly three litres of sauce. Luckily it gets better as it matures and will keep for years! Be aware it needs to mellow for at least three months for the spices to meld and soften. I’m still using up the last of the sauce made two years ago so by the time I’m finished that bottle, this batch will be ready to go. Worcestershire sauce can be used as umami boost in a wide range of stews, baked beans, gravies or dressings. 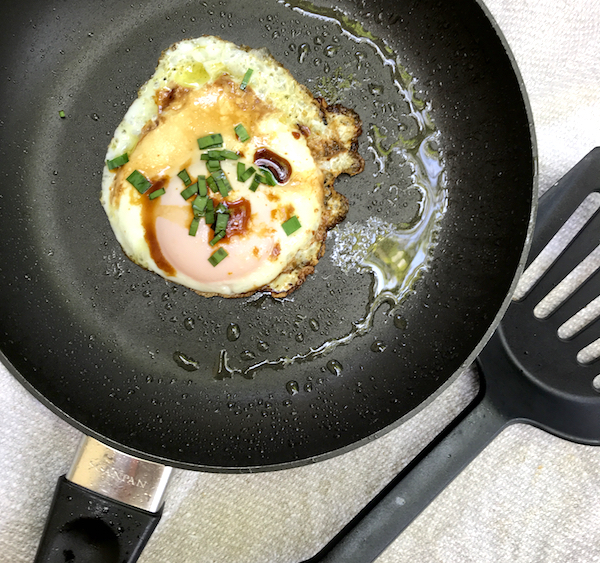 One of my favorite uses (because it reminds me of my Dad) is drizzled on top of a fried egg on toast. Bring to boil, reduce heat and simmer for 3 hours. Strain and pour into warm *sterilised bottles. Seal immediately. *You can adjust the amount of fruit depending on how thick you want the sauce and the type of fruit you’re using. I used red plums which are a bit watery then cherry or Damson plums and I used nearly two kilos and cooked the sauce a bit longer. * I sterilise my bottles washing and rinsing them well and heating the in 120C oven for 20 minutes. I boil the lids in water for 10 minutes.